This comes as a big surprise! 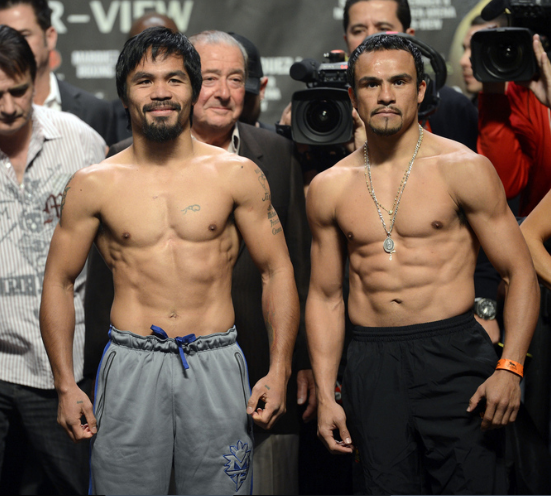 Manny Pacquiao was knocked out by Juan Manuel Marquez on the 6th round, one second before the end of round six. Marquez who has a bloody nose dropped a solid straight punch to Pacquiao's chin. Thus Pacquiao was knocked out cold to the canvas just before the bell. Juan Manuel Marquez survived a broken nose and standing eight count to beat Manny Pacquiao with a stunning sixth-round knockout. I didn't except that! I thought at first, Manny will gonna win after I watched the first up to fifth round. But everything has been changed until Marquez punch Pacquiao straight to his face that made him knocked down.